A view of the historic Cape Canaveral Air Force Station. Cape Canaveral is a region on Florida's Atlantic coast about halfway between Jacksonville and Miami, and a short drive from Orlando. The area has two active launch facilities: Kennedy Space Center (on Merritt Island) and Cape Canaveral Air Force Station (on the cape itself). The area is also known as Florida's Space Coast. 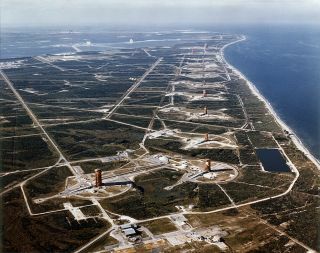 Cape Canaveral was briefly renamed Cape Kennedy between 1963 and 1973, in honor of the assassinated U.S. president, John F. Kennedy. Kennedy, in a speech before Congress in 1961, famously challenged rocket scientists to put a man on the moon within 10 years; the first moon landing took place in 1969. The name change was put forward by Kennedy's successor, Lyndon Johnson, but the decision was reportedly unpopular among Florida residents. In May 1973, Florida governor Reubin Askew signed a state statute mandating a change back to Cape Canaveral, to which the U.S. Board of Geographic Names agreed. It should be noted that some of the locations below have changed names several times over the last few decades. For simplicity's sake, they will be referred to here by their present-day names unless otherwise indicated. The cape's legacy in the space program began in 1947 when it was designated a missile testing range, according to the 1978 NASA history book "Moonport: A History of Apollo Launch Facilities and Operations" by Charles D. Benson and William Barnaby Faherty. "Its choice as a missile range was dictated by several factors," the authors wrote. "The planners could set up a line of tracking stations stretching southeasterly over the Atlantic to provide the longest range necessary for missile testing; the Banana River Naval Air Station could serve as a support base; and the launch area was accessible to water transportation." The area was then rather rustic, with a few beaches, houses and an inn, the authors added. It also was heavily populated by local wildlife, including mosquitoes, alligators and rattlesnakes. It posed a challenge for construction workers, who finished the first concrete pad on June 20, 1950, on top of a gravel layer they decided to put in while watching their trucks and jeeps sink into the sand. An old shack served as the first launch control block house. The first launch attempt took place on July 19, 1950 – it was a Bumper 7 rocket, which didn't get off the ground due to salt-air corrosion. A follow-up launch with Bumper 8 on July 23 went successfully. "By the mid-1950s, rocket technology in the United States had reached the stage where serious consideration was being given to proposals to launch Earth satellites," wrote NASA in a history of the Kennedy Space Center. The United States planned to place a satellite into orbit in 1957-8, for International Geophysical Year — something the rival Soviet Union also planned to do. Several U.S. military services competed for the honor, which was eventually awarded to the Naval Research Laboratory. Project Vanguard, as it was known, was given the job in part because it gave the opportunity to create a civilian rocket unaffiliated with previous armed service efforts. The Soviet Union sent Sputnik aloft on Oct. 4, 1957; the Vanguard team tried to follow up with a launch in December, but the rocket exploded during takeoff. The Army ended up sending the first U.S. satellite, Explorer 1, into space on Jan. 31, 1958, on a modified Jupiter-C rocket called Juno 1. Vanguard finally sent its satellite, Vanguard 1, into space on March 17, 1958. SpaceX's Falcon 9 rocket launched from Cape Canaveral Air Force Station in Florida the night of Sept. 21, 2014, carrying supplies and experiments aboard a Dragon spacecraft to astronauts on the International Space Station. NASA was created on Oct. 1, 1958, to expand the U.S. space program under civilian terms. The new agency absorbed the former National Advisory Committee for Aeronautics and took over several facilities across the country. NASA also acquired 150 Project Vanguard personnel, including an operations group at the Cape that was placed under the direction of the newly renamed Goddard Space Flight Center. "During this period, the Cape was transformed from scrubland into a major launch base," NASA wrote, which included Army tests of Redstones and Jupiters; the Navy's Polaris missile, which launched from submarines; and the Air Force's Thor, Atlas, Titan and Minuteman intercontinental ballistic missiles. Several of these later formed the basis of rocket stages for NASA human and satellite programs. Then in December 1959, the Department of Defense agreed to transfer to NASA a team of 5,000 civil servants led by Wernher Von Braun — the same man who successfully led Explorer 1's launch. Von Braun was tasked with creating several rockets during his time with NASA, including the famous Saturn V that eventually hefted astronauts into space for moon missions. In May 1961, astronaut Alan Shepard made the first U.S. flight to space from what is known today as Cape Canaveral Air Force Station's (CCAFS) Launch Complex 5. Shepard's flight inaugurated the one-man Mercury program; the station also launched the first orbital flight in 1962 and the first two-man Gemini flight in 1965. Today the station is known for launching spacecraft that collectively have visited all the planets in our solar system. Examples include the Mariner series, the Pioneer series, Voyager 1, Voyager 2, Mars Pathfinder/Sojourner, Cassini and MESSENGER. While NASA is a heavy user of the station, other entities have launched from it as well. For example: Launch Complex 40 and 41 saw the launch of several defense missions in weather, reconnaissance and communications. Today, SpaceX leases Complex 40 for its Falcon 9 launches, including Dragon spacecraft cargo runs to the International Space Station. United Launch Alliance leases Complex 41 for Atlas V rocket launches that bring satellites into orbit; ULA has also launched some Cygnus cargo spacecraft to the ISS. A SpaceX Falcon 9 rocket lifts off from Space Launch Complex 40 on Cape Canaveral Air Force Station in Florida at 10:10 a.m. EST, carrying a Dragon capsule filled with cargo to orbit. The SpaceX Dragon capsule is making its third trip to the International Space Station, following a demonstration flight in May 2012 and the first resupply mission in October 2012. Days after Shepard's flight, Kennedy made a pledge to Congress that the United States would send men to the moon and back safely before the decade was finished. This sparked the need for even bigger facilities than the Cape could provide. A joint Department of Defense and NASA study eventually settled on Merritt Island, just adjacent to the Air Force station. "The study concluded that Merritt Island offered compelling advantages," NASA wrote. "Several small communities were within easy driving range, and larger cities like Daytona Beach, Vero Beach, and Orlando were only slightly farther. Locating on Merritt Island also would allow NASA to share facilities of the Atlantic Missile Range, avoiding costly duplication. Only at this location could the same NASA launch organization continue operations on the Cape Canaveral complex while building the spaceport." Acquisition of the land began in 1962, with NASA eventually acquiring about 140,000 acres (57,000 hectares) on the island. The agency then began construction on Launch Complex 39 to launch the massive Apollo-Saturn V launch vehicle, which was 363 feet (111 meters) tall. NASA said these rockets required a facility for construction (known today as the Vehicle Assembly Building), platforms (nicknamed "crawlers") to transport the rockets between the facility and the launch pad, a control center for the launches and a movable service structure for launch preparation. There also was the matter of building two launch pads for the rockets to go into space, plus facilities for personnel and storage. A small visitor's center was created on site in 1966 and over the years, expanded into today's Kennedy Space Center Visitor Complex. Eventually, KSC saw the launch of all the crewed Apollo missions (1968-1972), including 1969's Apollo 11 – the mission that fulfilled Kennedy's pledge of a human moon landing by the end of the decade. In future decades, KSC became best known for the space shuttle program; the VAB, the crawler and other facilities were all modified to accommodate the shuttle's smaller height and different systems. Many space shuttles landed on a runway at KSC. As the space shuttle helped to construct the ISS, many pieces of the station left Earth from KSC as well. KSC also hosted several missions that ended in failure. A pad test for Apollo 1 on Jan. 27, 1967, ended in a fatal fire, killing three astronauts. On Jan. 28, 1986, the Challenger space shuttle exploded during takeoff and killed seven astronauts. And on Feb. 1, 2003, the Columbia space shuttle broke up over Texas (killing seven astronauts) after launching from KSC a few days before. NASA has an annual day of remembrance to commemorate all lost astronauts, and it also has a reflective space mirror memorial in the visitor's section of the complex. Today, facilities at KSC are being reused once again for NASA's Commercial Crew program, which is expected to start sending humans to the space station in 2018, as well as NASA's Orion program that is expected to bring humans out into the solar system in the 2020s. KSC is also billing itself as a multi-use spaceport and is leasing out its facilities to several entities, including Boeing, SpaceX, Lockheed Martin and Space Florida.